What is the Best Fish Finder for Kayaks? If you like fishing and you like kayaking, then why not combine the two? Kayaks were originally made for fishing and hunting. The best kayak brands are small and easy to maneuver, and you can navigate to places where you might not be able to get to using a boat. This is also a great way to combine exercise with a relaxing pastime. Making sure you have your fishing kayak setup properly is important, and the right equipment will make your experience more enjoyable. Like, if you don’t have rod holders on your kayak, fishing is going to be almost impossible! If you need to stay still and you don’t have an anchoring system, then you will be floating away from your desired spot! So, you will need to make sure you have the right fishing kayak accessories. You will need to consider the area in which you will be fishing and the kind of water you will be fishing in. Invest in a portable fish finder; kayak away to your heart’s content, following those fish. This fish finder boasts a 4.3 inch, all-weather screen with a high definition back-lit LED display. You can even live-stream sonar data directly to your smartphone using Raymarine’s WiFish smartphone app. You can save the day’s catch, look back over what you have achieved. You can tell everyone about your day’s fishing from your kayak fish finder, mount it up and use the built in WiFi to share results on social media. US rivers, lakes and coastal maps are all included. It is fitted with a CHIRP transducer with a temperature sensor and dual-channel sonar. There is one conventional sonar channel for targeting the fish and wide-spectrum CHIRP DownVision sonar for more photo-like images. The Raymarine comes with a MicroSD card reader so you can save your sonar shots. Some users have reported trouble with the GPS signal when traveling at speed. So, if you are zooming along in your Lifetime Sport Fisher kayak, you may experience some signal loss. 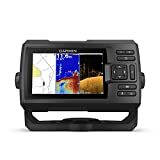 Similarly priced to the Raymarine, the Garmin uses high-frequency Clearvu scanning sonar as well as CHIRP sonar. This sonar creates images that are near-photographic, with very detailed visuals of the surrounding objects and fish. The keypad is simple, as is the installation process, and it is easy to use. You can also purchase this device in multiple screen sizes (3.5, 5 and 7-inch displays). This does not come with maps, but you can use the waypoint map to navigate to locations and mark points. It has a built-in flasher so you can view your data in the classic flasher arrangement. For this kayak fish finder, the battery is required to power is. A 12-volt battery will be adequate to keep you up and to run. 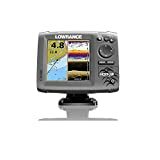 The Lowrance Hook-5 is a bit more expensive than the previous two. The display is 5 inches and is high resolution and color. It uses CHIRP sonar and down scan imaging to give you a great view of what is beneath your boat. It has a built-in GPS antenna which is very accurate and a detailed map. The US map features more than 3,000 lakes and rivers and displays coastal contours up to 1,000 ft. This battery powered depth finder comes with optional upgrades. There are options for chart upgrades which include Lake Insight and Nautic Insight Pro and fishing hotspots pro, to point you in the direction of the best places to fish. This unit doesn’t get the best reviews, considering the price is higher than the other devices. At the lowest price of all, the Hawkeye has a VirtuView color display in high-definition. It boasts a dual frequency FishTrax Intelligent sonar and a fish depth identifier. You also may view your readings in flasher style visuals. One of the best features about this fish finder is that it is both boats mountable and portable. This enables you to use it as a hand-held device as well. It will tell you the depth of the fish beneath you and has auto zoom based tracking. This device may not be the most high-tech gadget out there, but it is ideal for beginners. It is more affordable than some of the more high-tech models, and it is straightforward to use. We think it is the best portable fish finder for kayak.